Heat-activated reconstructor milk for weakened hair.Worried about using heat-styling tools on your already damaged hair? 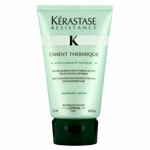 Well worry no more thanks to Kerastase Resistance Ciment Thermique. Its formula is specifically designed to protect weakened hair during styling, whilst internally strengthening the hair fibre. Your locks will be left firm, supple and energized.